When you’re searching for ways to take your earthmoving and material-handling capabilities to the next level, top- quality articulated trucks offer the right blend of power, capacity and durability. 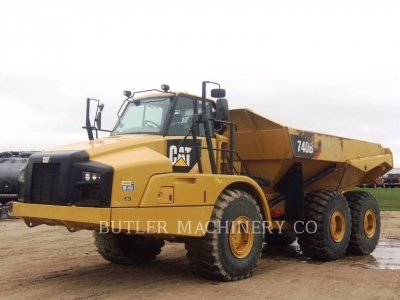 Butler Machinery in North and South Dakota is home to an extensive selection of low-hour articulated trucks for sale in the Dakotas manufactured by Caterpillar and other leading Allied brands. We’re proud of our commitment to our customers and will go the extra mile to ensure your success. The late-model, low-hour articulated trucks we carry deliver the productivity and efficiency to lower operating costs and maximize profitability. Whether you’re hauling dirt on a muddy construction site or transporting aggregates from the mine or quarry to a processing facility, the right equipment speeds up cycle times and improves material retention. Our used articulated trucks are maneuverable enough to navigate tight spaces and high-traffic job sites while providing the traction, power and durability to handle the most robust applications in challenging underfoot conditions. As the authorized Cat dealer for the region, we’re home to a broad range of pre-owned models that set the standard for comfort and performance. We offer reliable articulated trucks for sale in a variety of sizes and configurations to ensure an efficient fit. We’re continually adding well-maintained units to our inventory and can often track down the models you’re looking for through our extended dealer network. There’s peace of mind investing in quality used equipment sold and serviced by the industry leader. We go to great efforts to ensure every piece of equipment we sell is worthy of the Butler Machinery name. Our reliable articulated trucks for sale provide the massive earthmoving potential you’re looking for at a fraction of the price of purchasing new. For over 60 years, Butler Machinery has been dedicated to helping our clients find the cost-effective solutions you need to grow your business. In addition to our selection of used articulated trucks for sale in the Dakotas, we also offer flexible short- and long-term rentals for an affordable way to supplement your fleet. Give us a call, contact us online or visit a location that’s convenient to your area. Our knowledgeable sales representatives will be happy to answer all your questions and provide additional details about our current pre-owned inventory.